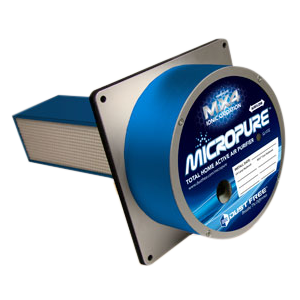 The MicroPure® Total Home Active Air Purifier uses a unique new indoor air quality process to naturally produce airborne scrubbers that actively seek out and destroy pollutants in the air AND on surfaces. MX4™ Ionic Oxidation utilizes propriety metallic technology and UV light energy to naturally produce ionic air scrubbers and destroy many indoor pollutants, such as bacteria, viruses, mold, VOC's, mildew, allergens, and odors. ALL NEW MX4™ Ionic Oxidation eliminates pollutants in the air and on surfaces. Active purification throughout all living spaces 24 hours a day. Eliminates bacteria, mold, viruses, mildew, smoke, odors, VOC's, and more. Ionic air scrubbers destroy indoor contaminants anywhere the air goes. Unique air purification process even cleans air that doesn't pass through the HVAC system. Installs in any HVAC system. NASA-developed technology for use in the International Space Station. 24V and 120V/230V power supply options. Long life warranty. 5-yr power supply, 4-yr MX4™ core, 2-yr UV lamp.